Who's Minding the Drug Store? But remember, we don't actually sell our products. discussing incomplete bibliographies because, perhaps ironically, this editorial contained no bibliography itself. In her article "Can computers untangle the neural net?" The sequestration of cryptozoology in a small Swedish enclave? about history with much interest and agreement. In "Middle-aged scientists are most potent," K. Brad Wray writes that "young scientists still play a crucial role in science. Public research universities face enormous challenges in the 21st century, perhaps none more compelling than the obligation to serve society. Britain's science community has never seen anything quite like it. Publishing 10 papers in one year is difficult for most scientists. In the mid-1970s, the prestigious Rhodes Scholarship, the program that gives US recipients the chance to study at Oxford for two to three years, included just one or two future scientists per year, out of 32 awardees. More than 2,000 years ago, Hippocrates wrote: "Leave your drugs in the chemist's pot if you can heal the patient with food." Did Enzymes Evolve to Capitalize on Quantum Tunneling? In the early years of the 20th century, a new theory, quantum mechanics, revolutionized physicists' understanding of nature. Viruses are masters of disguise when it comes to slipping past host-mediated defenses. For the first time, scientists have described a way for cells to add phosphate groups to proteins that doesn't involve an ATP donor. Adipose tissue does more than store triglycerides. 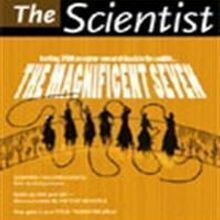 To any movie buff, TM7 refers to the 1960 John Sturges movie, The Magnificent Seven, in which a 30-year-old Steve McQueen burst onto the scene fighting alongside Yul Brynner, Charles Bronson, Robert Vaughn, and James Coburn to defend the homes of an oppressed Mexican peasant village. Two decades ago, in the high-flying 1980s, there was great hope for licensing newly described molecules, compounds, and targets as potential diagnostic and therapeutic agents. The information highway is adding lanes. Traditional gene therapy is built on a simple premise: If the absence of a gene product causes disease, then adding the missing gene will cure it. These days RNA interference seems to be everywhere. Scientists at Purdue University, led by Graham Cooks, professor of analytical chemistry, recently reported a novel method for processing samples for mass spectrometry (MS) analysis. has built an entire company around its Dynabeads, which are tiny paramagnetic particles that bind target cells, proteins, or nucleic acids, and can be removed in seconds with a magnet once their work is done. For decades, cytogeneticists have pored over images of metaphase chromosomes from tumors, noting the many gross aberrations these karyotypes can reveal. In a recent three-hour session at a Chicago hotel room, the University of Wisconsin's technology transfer office hammered out the final details of licensing deal that granted Durham, NC-based Inspire Pharmaceuticals the right to use several patents to develop glau coma treatments. Much like an uncertain weather forecast predicting sun and patchy clouds, industry analysts see mixed prospects for European biotechnology companies in 2005. Developmental biologists in Asia have taken steps to forge a closer scientific community in recent months. Germany's belated attempt to bring its biotechnology patent law into compliance with an EU directive issued in 1998 appears to contradict what the European Union mandated, meaning the issue could end up being debated in the European Court of Justice. The American Chemical Society says Google's new academic and scientific search engine, Google Scholar, is infringing on its established search product, Scifinder Scholar.